After spending several weeks buying prints and finding frames in local charity shops, I was ready to create my new gallery wall in my office corner. Hours I spent, trying to come up with the perfect gallery wall composition, command strips bought and the wall freshly painted in Hague Blue by Farrow & Ball to give it the perfect backdrop. I wanted to create a Scandi inspired gallery and measured out the size of the wall where the prints were going by using frog tape on a rug and rearranging the prints until I was happy. A Scandi inspired gallery wall. I put aside a morning to put up the gallery wall and was really excited to see the results. And then it dawned on me, the gallery was going on a wall which was directly opposite a large window, so it didn’t matter how you displayed the prints, you couldn’t see the damn things! I’m a serial decorator, how did I not see this coming? A whole morning wasted, when I could have been watching daytime TV with a coffee and my feet up! I was back to square one with just a dark blue wall to stare at behind my monitor, leaving me with very little inspiration. I poured over my saved pins on Pinterest to figure out what I could do with the wall and quickly decided that it was crying out for a wall mural! 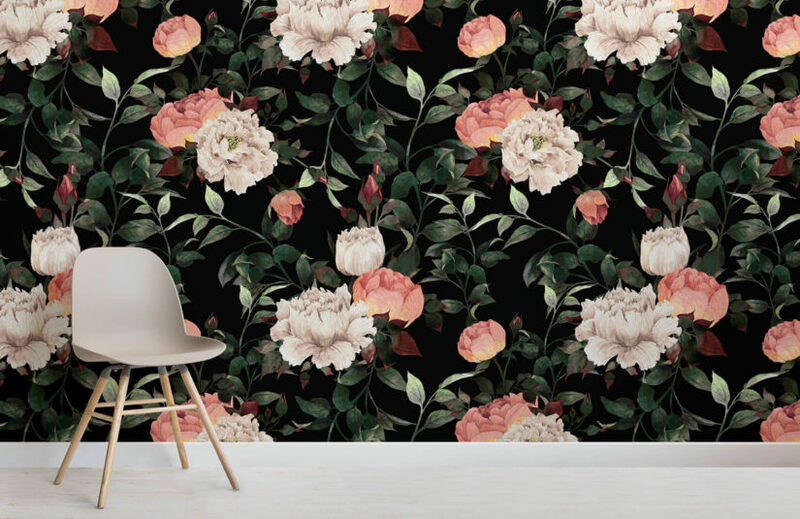 I have always loved the dark floral wallpapers adorned with vintage and still life flowers, teamed with luxurious velvet chairs and accessories and decided to find the perfect mural to fit in the small space I had in the office (and a velvet chair whilst I was at it!) 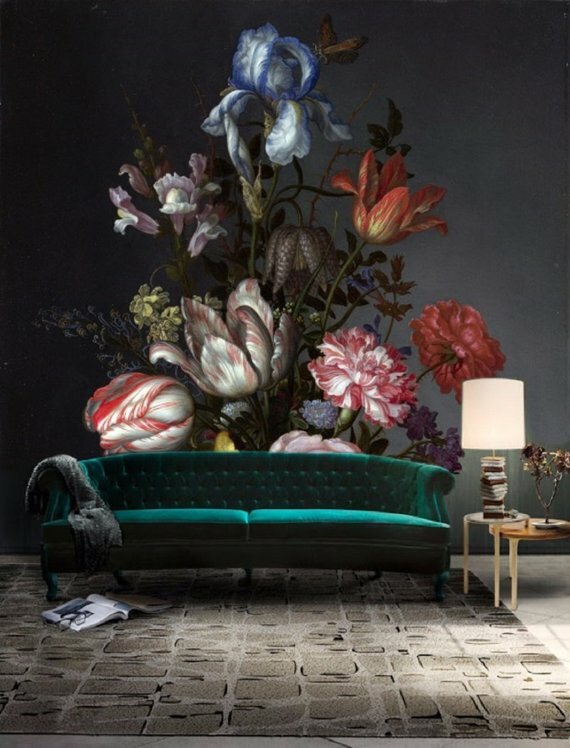 Scandi was out, dark and luxurious was in… That was, until I saw the price! Most were retailing between £185 (+ shipping) to well over £450 and with my bank balance looking in a very poor state due to the amount of cushions and candles that kept falling into my basket, I realised I needed a completely different approach to my wall problem. I knew that I would never be able to recreate a stunning floral mural as seen in the pictures above, my drawing skills consist of stick men and butterflies, but doodle? That I could do. I’ve always been completely inspired by several accounts on Instagram with their ability to come up with amazing chalkboard drawings and hand painted murals, making it all look so effortless and unique. I had previously created a very small chalkboard doodle in my guest bedroom, so decided to give it a go on the office wall, just on a bigger scale. Armed with a pencil, a very fine paintbrush and two B & Q tester paint pots, I set about creating a doodle mural with just my limited imagination and the help of typing “doodle” into google (like I said, my imagination stretches to stick men and butterflies!) I didn’t have a plan or a set pattern I wanted to keep too, I just decided to draw and see what happened! It took me about 3 hours to complete the initial pencil stencil and once I was happy with it, I started painting over the top. The very technical doodle kit! It’s not even straight?!?! This is the switch, not my angle. It’s like the switch isn’t even there. Just don’t look to closely! With the light switch covered, it was just a case of finishing painting the doodle and filling in gaps that I couldn’t see when initially drawing in pencil. I then moved the office desk and equipment back into place and created a few more doodles around the equipment to make it look like it was radiating from the monitor! Ta-dah!